When doing a home decoration project, do not decorate all the other rooms and forget the kitchen. The kitchen is seen as the heart of every home. Since you are going to spend long hours here, you should probably beautify it using rugs. Rugs in the kitchen can be placed near the kitchen door, under the fridge or below the cabinets, near the worktops or the cooking stove. If you have a rug underneath your feet, then even if you stand in the kitchen for long hours cooking or preparing recipes, you will not get tired because your feet have a soft cushioning underneath. When buying an area rug, you should consider the fact that all kitchens are different. Since you are going to spend quite an amount, you should ensure that the rug that you are buying would fit your kitchen perfectly. Depending on the design of your floor, you can place your rug in any part of the floor that you wish. Most people prefer to place one in front of the sink so that they can have something under their feet as they stand. It is good to choose a rug that looks good based on style and color, or something that will match with any other decorative elements in the kitchen, such as curtains. However, this should not be the basis of your selection. You should consider the other factors in this list. The kitchen is a high-traffic area. Choose a high-quality rug that can withstand the high traffic. A good rug is one that has sharp edges and can withstand the daily use without fraying. Do not buy a rug that you will be forced to replace within a short time. The size of the kitchen rug depends on the dimensions of your kitchen. If you prefer a large rug, then, it is advisable to take the measurements of the biggest possible area that can be covered by the rug. However, it is ideal to purchase several small kitchen rugs that you can place in front of the sink, stove, near the fridge, the worktop or the kitchen door. These are the areas that are known to experience high traffic; thus, the rug will protect your wooden or tile flooring, while at the same time, providing a soft cushion for your feet. Kitchens may at times be a bit slippery since they are built with non-carpeted flooring. Thus, the best rug is one that does not slide around. Look for a non-slip rug that can stay in place. A rug that slips around will be more of a nuisance than being helpful. 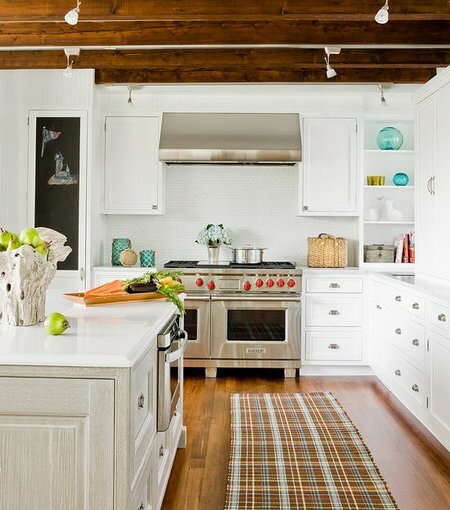 Since the kitchen is a high-traffic area, kitchen rugs will tend to get dirty often. Choose a rug that can be washed by hand or machine so that you can always keep your kitchen looking clean and tidy. Generally, it is important that you choose quality rugs so that you will not need to replace them repeatedly.